You have a beautiful website, advertisement, blog post, or social media post, but it’s missing something. If you don’t have this one thing, you might not be making the most out of it. Your users come to the site, they look at the home page, and then they leave. They go to the product page, but they never buy. They look at your ad, but you never get any calls. What makes a user do something? How do you get them to do what you want? Think you know what it is? It’s a Call to Action. Like the title and headings of this article, Calls to Action or CTAs are designed to catch the reader or user’s attention and guide them towards the next step. 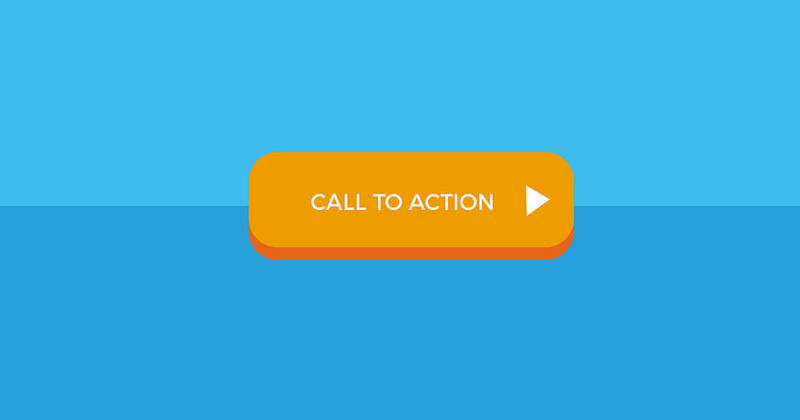 A Call to Action should provide all of the information your reader needs to take the next step. Keep it short, but descriptive. It should entice the reader to take an action, but it should make it seem like the reader’s idea. “Call us to learn more” because the reader wants to learn more. “Read this article” because the reader is convinced they need to. CTAs can help you accomplish your business goals too. If your goal is to sell a product, then your CTA should match that. Try using “Buy Now” or “View Our Prices” CTAs. This method also provides your reader with a logical next step for accomplishing their own goals, which can be especially helpful if your prices are on a different page, or the user needs to fill out a form. Letting the user know what they need to do helps both you and your user. Combining images with CTAs can also be especially successful. Images draw attention to your CTA, which can increase the number of readers who click the link. If your goal is to gain Facebook followers, then try using “Like us on Facebook” in conjunction with the Facebook logo for the call out. This will draw attention to your CTA faster visually. For blog posts, you might try adding a Facebook share button at the bottom of the page too. 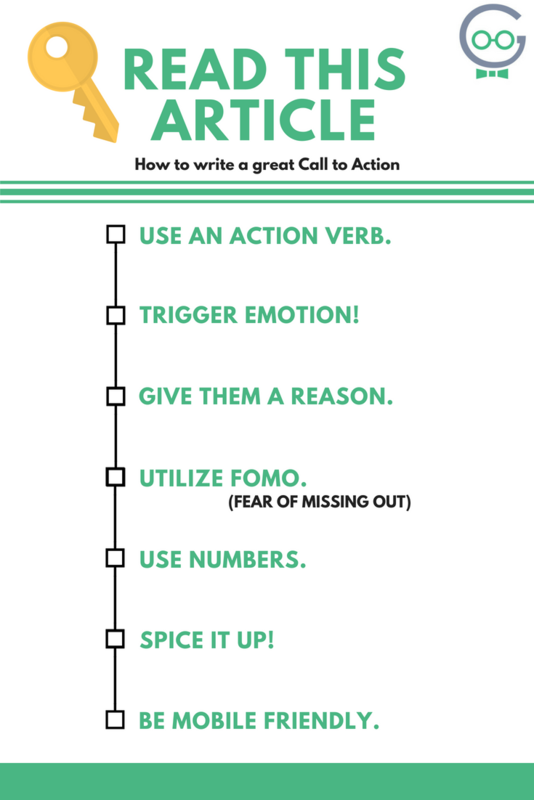 Writing Calls to Action is an art rather than a science. There are some guidelines you should follow to make sure that your CTA works. Similar to using an action verb, make your reader excited about what you’re offering. Something as simple as using an exclamation point can accomplish this. Make sure the reader knows what’s in it for them. Remember, you have to make them want to take action. Find out what your Unique Selling Point or USP is, and use it. Do you offer free quotes or a one-of-a-kind service? Mention that! FOMO stands for Fear of Missing Out. Users are more likely to take an action if they think they are losing out. Things like “Today Only” or “While Supplies Last” are sure to trigger FOMO. The shorter the CTA, the better. Numbers give your reader access to quick and easy to digest information about your product or sale. Get creative! Using the same language can get repetitive and eventually your reader will just ignore it. Mixing up what you say can attract attention better. More users search with mobile devices than desktop devices. Ensure that your site is mobile friendly from the start. Techno Goober can help ensure that your site is mobile friendly from top to bottom, so your new CTAs shine. For help developing your marketing strategies or incorporating Calls to Action on your site, call Techno Goober today at 302-645-7177. Or, learn more about CTAs by visiting our friends over at Word Stream.